YOKOSUKA, Japan - The staff of Commander, Submarine Group 7 and crew of a Los Angeles-class fast attack submarine are participating in exercise Keen Sword 2019. Keen Sword, which began Oct. 29, is the latest in a series of joint/bilateral field training exercises that for more than 30 years have increased combat readiness and interoperability between the U.S. military and Japan Self-Defense Force (JSDF). Approximately 10,000 US service members will conduct training with their JSDF counterparts from military installations throughout Japan and surrounding waters. 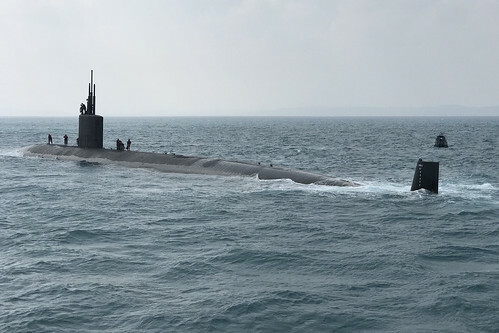 In the case of the submarine force, Keen Sword is an opportunity to demonstrate how the countries’ submariners would detect, locate, track and engage enemy assets. The Submarine Group 7 submarine warfare team was involved in realistic scenarios and drills with their Japan Maritime Self-Defense Force (JMSDF) counterparts in one of the Indo Pacific’s biggest bilateral events. American and Japanese submariners collaborated both at sea and ashore in a series of complex events designed to boost their ability to work together, especially in a conflict scenario. "We work closely with the JMSDF Fleet Submarine Force on a daily basis," said Rear Adm. Jimmy Pitts, commander of Submarine Group 7. "We are eager to take advantage of Keen Sword as a venue to practice important tactics, techniques and protocols such as at-sea communications and coordinated submarine operations that strengthen our joint warfighting readiness." The exercise also includes a simulated submarine casualty, or SMASHEX, in which an allied submarine suffers an underwater casualty. It is an event that encompasses elements of search, escape and rescue, and gives participating navies insight on the measures and actions necessary in the unlikely event that a submarine finds itself in a distressed state. Submarine Group 7 is comprised of submarines deployed to the Western Pacific, four fast-attack submarines homeported in Guam, and two submarine tenders, USS Frank Cable (AS 40) and USS Emory S. Land (AS 39), also homeported in Guam. It securely conducts persistent undersea warfare and anti-submarine warfare operations in the 5th and 7th Fleet areas of responsibility covering nearly half of the Earth's surface.